Note: These flexibility and stretching exercises are suggestions only. Patients should only spend about 5 minutes within each class performing flexibility and stretching exercises as the emphasis within the class should be on endurance and strength training. The flexibility and stretching exercises could be incorporated into the home program. Trainers should prescribe and modify appropriate flexibility and stretching exercises according to individual needs. Flexibility of the joints in the spine (particularly the thoracic spine) is important for people with respiratory disorders to enable thoracic mobility when breathing. The exercises in the table below are designed to move the joints through their range in order to improve or maintain flexibility. Patients should perform two or three repetitions of each exercise using slow, smooth movements. Patients should only perform each exercise as far as they can without causing pain/discomfort. 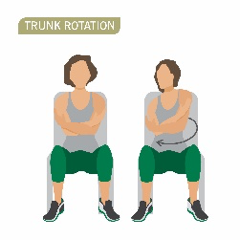 Gently rotate the trunk side to side. Slowly make circles with elbows. The pectoral muscles may become shortened as a result of the forward lean position adopted by many patients with COPD when breathless, and therefore it is important to include stretches that aim to maintain the length of the pectoral muscles and in doing so this may improve posture. Ask the patient to perform two or three repetitions of each stretch. Patients should gradually lengthen the muscle to the point that feels as if they are stretching the muscle, but no pain is experienced. After this point is reached, the patient should be asked to “hold it there”. Encourage the patient to gradually stretch a little further if they feel able to do so. Encourage patients to breathe while stretching, some patients hold their breath and others are unable to hold stretches for as long as 5 seconds due to breathlessness. The exercises in the table below have been designed to help patients stretch muscles in their upper and lower limbs. Stand in the corner or in a doorway with your hands at shoulder level and your feet away from the corner or doorway. Lean forward until a comfortable stretch is felt across the chest. Take extra precaution if patient has shoulder pain. 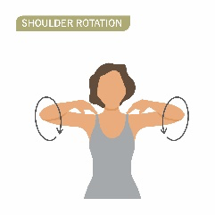 Lift your arm so that your elbow is next to your ear. Place your hand between your shoulder blades. Gently push your elbow back with your other hand until you feel a stretch.